On March 27, a Minke Whale breached the perfectly flat sea off Traffic Jam dive site in Gorontalo. Our boat captain watched the 10-meter long whale jump into the air. It hit the water with the belly-flop style characteristic of this whale. The Minke jumped four times and also blew water into the air. Divers that day had already descended. We heard several loud bangs but did not realize a whale was breaching less than 400 meters away. Miguel’s Diving has reported this exciting encounter to the APEX Environmental’s Coral Triangle Oceanic Cetacean Program. We have reported whale sightings to APEX for about ten years. 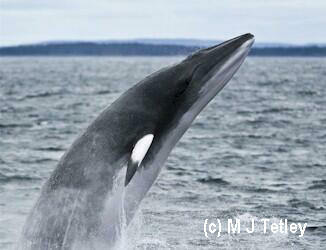 Minke Whales (Balaenoptera acutorostrata) are the smallest type of rorqual whale. Rorquals have numerous, distinct pleats of skin under their chin. These can expand to hold tons of water when the whale opens its mouth to feed. They eat krill, fish and squid. A Minke Whale uses the baleen of its upper mouth to filter food out of the water held in its mouth. They can be found in all oceans and live up to 60 years. A Minke Whale can weigh up to 10 tons. With populations numbering over 500,000 the Minke Whale is not considered to be endangered. Four days after Miguel’s Diving staff sighted the breaching Minke Whale, whales living in the southern oceans received good news. The International Court of Justice in the Hague sided with Australia in a suite against the Japanese whaling industry. The Court determined that the annual hunt was not for scientific purposes as claimed. The Court ordered a halt to any more whaling in the southern oceans. Japanese demand for eating whale meat has declined drastically over the last decade. According to news.com.au, the meat of more than 2,300 Minke Whales is sitting unsold in freezers in Japan. Whalers had planned to take 1,300 whales annually, despite plunging sales. Minke whales are also hunted in Iceland and Norway. Everyone here is happy that the Minke Whale we saw will not end up in a freezer! For your chance to dive the blue waters of Gorontalo, please take a look at our dive packages and send an email to info@miguelsdiving.com.